Howdy y’all you stand so tall. Hello and welcome to China once more (you can imagine you’re here.) One of the small restaurants outside the college where I work rescued a little puppy dog some time back. I was quite impressed with this act of kindness. Apart from the traditional occupational hazards which are well known to the dogs here, unless a dog grows up with a peculiar ability to be street wise it’s very dangerous for it to venture from home since being just a few feet away from it can result in injury or death due to the many motorbikes, scooters, 3-wheeled motorcycle rickshaws, cars and mini vans which can arise in an instant. The latter vehicles are less frequent, the motorbikes and scooters are the predominant form of transport here having replaced the bicycle for the most part. This process began about 30 years ago. Having said that there are nevertheless numerous street dogs which fend for themselves. To this degree they don’t have a home to venture from and their instincts in regard to traffic are different and they seem to survive the traffic at least although occasionally you see a dog with a limp. Another class of dog and this sometimes includes pigs and goats, is that type which belongs to somebody but they’ve been given freedom to roam around. Some locations are safer than others, for example inaccessible villages or a wide, straight road with equally wide sideways (sloping upwards from the road) leading to shops and houses. The sideways (as I term them) may have trees. The single biggest necessity for living in a tropical area or sub-tropical area, is trees. 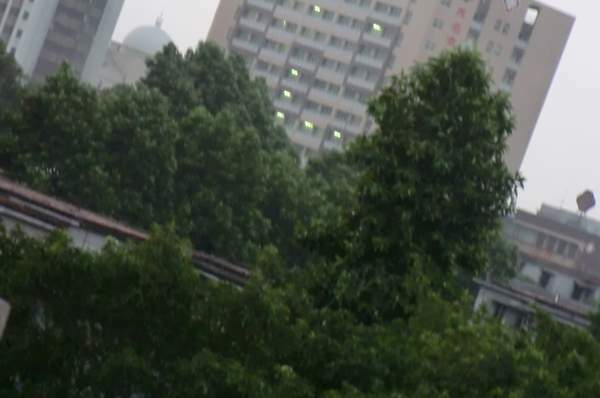 Not withstanding the Chinese inclination to adopt Western practices, they actually recognize the need for trees in villages, towns and cities. They provide soil stability, water absorption in times of rain, shelter from the sun and rain, oxygen, natural life, staging posts for adverts, posts for washing lines, frames for decoration aesthetic value and a place for children to play to name a few examples. Nobody’s going around shouting “Health and Safety!” or “That tree might fall on a car.” It’s like going back in time to see that, yes, these things really work. Why did I mention the puppy dog? Because I just happened to be thinking about it. Over time I have visited it and played with it and now I sometimes take it for a walk since it is tied-up. Maybe if it had shown an inclination to stay strictly within the confines of the restaurant the woman who rescued it might have allowed it that freedom which those other dogs have (although they’re a minority). However there’s a very narrow road outside the restaurant and it only needed to take one step in the wrong direction to be hit by a man on a motorbike or scooter. The woman was angry with that person. From what I’ve been told he was travelling too fast which is common. The puppy recovered thank God but I think she’s afraid of letting it loose. She allows me to take if for a walk and I let it off the lead where I can. He (the dog) unfortunately likes to wander even after an energetic walk so he has to stay tied-up at home (home being the back yard of the restaurant). 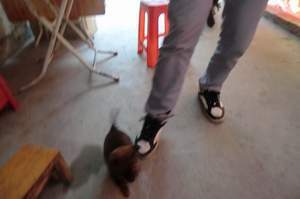 The Chinese don’t consider bringing their dogs indoors, at least not in this part of China, less influenced by the West but he’s on quite a long lead and he can go inside a shed. I’ve enclosed several photos of the puppy, including one with it standing behind the woman who rescued it and some which are blurred because he was moving when I tried to take photographs of him but he’s cute even as a blur. Another photo shows him walking into the side of the restaurant from the road which I mentioned. 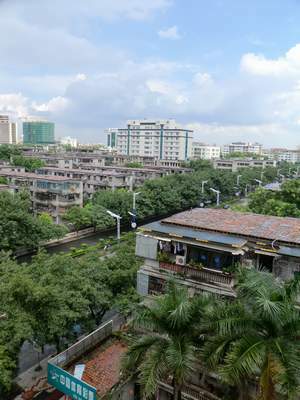 The city where I live and work is a small Chinese city and a more natural, harmonious place than the bigger cities, with customs less affected by modern development. When I say natural and harmonious I mean it works in that way for the people and the use of trees is part of that. I could say more about animals but I’m mindful of having being welcomed by the Chinese to work here and of being paid more than a lot of local people are. For that matter my own country has it’s shortcomings in regard to animal welfare which is often more deliberately malicious in nature reflected in some individuals rather than through ignorance. I mean if someone is cruel to animals in Britain they’re usually unpleasant to people as well but you may meet a man or woman who invites you into their home here (you are welcome as a stranger, the Chinese are friendly to the foreigners from the West) who may have a dog or a cat on a short lead or in a cage or something which we know to be cruel but they see animals quite differently to us. Perhaps ‘see’ is the wrong word; regard. And finally of course or perhaps firstly, I should consider my own behaviour.